Although we're more into reviewing experiences than products here on KidTown Melbourne, when we heard about a new Monopoly board game launched by Hasbro, we were all over it! 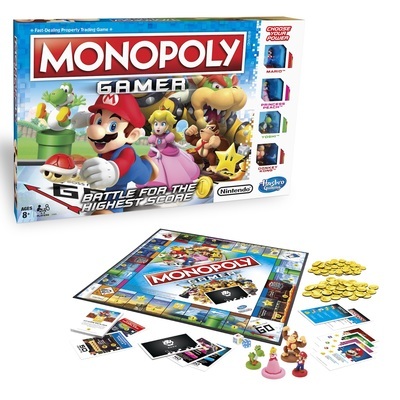 Hasbro's newest board game is a collaboration between Nintendo and Monopoly, who have combined forces to produce Monopoly Gamer featuring Super Mario Characters! Tapping into our child's love of two things; gaming and board games, this is a winner for the KidTown Melbourne household. 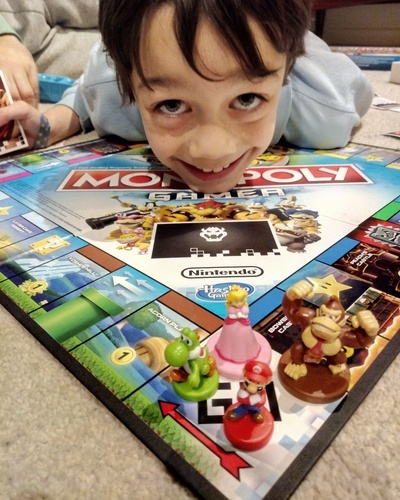 Mr.8 already was already a fan of the traditional Monopoly so when he saw a new Super Mario version of his beloved game, he could barely contain his excitement. In a rush trough the door after school when the parcel arrived, we set to work straight away to play Monopoly Gamer. On first impressions, the game looks to be a vaguely familiar set up, but it is quite different, dare I say easier, than the traditional Monopoly board game. There are no notes in Monopoly Gamer, only (cardboard) coins in $5 and $1 denominations, which certainly makes counting a little easier for the kids. There are four characters to choose from; Mario, Princess Peach, Yoshi, and Donkey Kong. Note you can buy extra characters by way of "Gamer Power Packs". Characters move around the board with the numbers reflected on the traditional dice, but there's a second power-up dice that can affect the other players. For example, throw a green shell and any player must drop 3 coins on their current spot on the board. Similarities to the traditional Monopoly board game is the ability to buy properties and collect money (albeit coins not notes), although rather than collect $200 when you pass go, you gain two coins and begin a "boss battle". There are eight boss battle cards and a player must "fight" to win it. To defeat the boss indicated on the card, the player must roll the die to the same or higher number to win the card. This is probably the trickiest part of the game to understand, but we got there. What I would recommend if you choose to buy the Monopoly Gamer board game is to watch the following YouTube video, which really helped us understand what to do. If you're looking for a fun new way to play Monopoly with your kids and possibly even tap into your own nostalgia, I'd highly recommend getting your hands on a Monopoly Gamer. Our kids are loving it and I can see many, many family games happening from this day forth! Family time win in this house. The Monopoly Gamer gets a big "power-up" from us.